On Friday, December 2, 2016, the R2 School District held their 25th annual Teacher of the Year program at 2 p.m. at the Performing Arts Center. The program also includes the Beacon Award, presented to a support staff member, for their efforts in their role to their school. 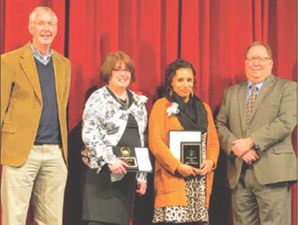 Each school offers a nominee for both the Beacon and Teacher of the Year. Candidates for Teacher of the Year submit an application which is then scored. They are then interviewed by a panel of judges. The winner is selected by a combination of the judges scoring both the written application and the interview. Both panels consist of three superintendents from northwest Missouri schools. Pictured left to right: Ed Douglas, Education Foundation; Teacher of the Year award winner Pam Miller; Beacon Award winner Kathy Midgyett; and R2 District Superintendent Dr. Roger Barnes. In opening remarks, Dr. Roger Barnes noted how the participating committee members have commented on the difficulty and struggle of concluding final decisions, mostly due to the quality and close comparison of the nominees across the board. "We have good teachers here," said Dr. Barnes before he joked that these area superintendents "like doing it so they know who to try to steal." Each nominee was introduced with remarks by students and faculty who witness their work ethic and commitment on a daily basis. Central's Kathy Midgyett was awarded the Beacon Award and a $300 prize for her unrelenting efforts as a support staff member. Other nominees were Sara Eller - Garrison, Marcella Murray - Dewey, Melody Munson - Field, Cheri Waggoner - CMS, Pat Ewing - CHS, and Mandy James - GRTS. All received a $100 prize for their nomination. Pam Miller of GRTS was awarded a $1500 prize and a $500 classroom prize as the 2016 Teach of the Year award recipient. Other teachers were Diana Holcer - Garrison, Ellen Hansen - Dewey, Katie Maples - Field, Donna Good - Central, Shaylee Redemacher - CMS, and Lisa Rule - CHS. All received a $1000 prize and a $500 classroom prize for their nomination.